This awesome black phoenix or gold firebird tungsten ring is a great everyday ring or wedding band as a tungsten ring is tough and strong. The legend of the phoenix is a unique and beautiful bird that lived six centuries in the desert then burned itself on a funeral pyre and raised from the ashes to live another life. Therefore the phoenix is a symbol of rebirth from the ashes of the past, renewed life and spirit. 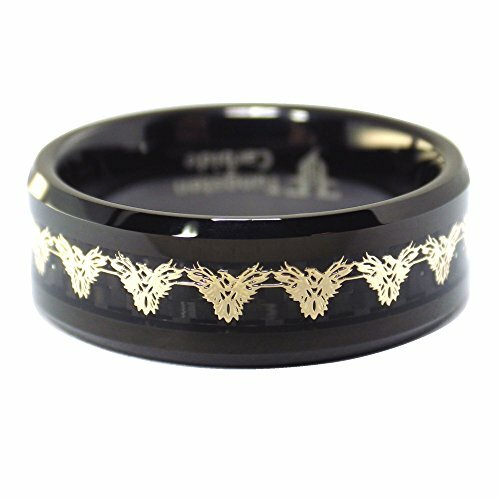 The ring has two inlays a gold color phoenix and black carbon fiber that continues around the entire band, it is then given a clear resin protective layer. The ring is made of solid tungsten carbide with a high polished black PVD finish. The band is 8mm wide and is a comfort fit. Available in ring size 5, 6, 6.5, 7, 7.5, 8, 8.5, 9, 9.5, 10, 10.5, 11, 12, 13, 14, 15, 16 or 17. A tungsten phoenix firebird ring will get noticed, be ready for many compliments! Men's and women's 8mm wide gold tone phoenix firebird ring or wedding band with black carbon fiber, made from tough nickel and lead free solid hypoallergenic black tungsten carbide. Tungsten Carbide is the hardest metal, harder than titanium, tungsten will never bend like traditional gold and sterling silver rings. Please note: Ring sizes are not gender specific like shoes and clothes; a size 9 is still a size 9 - male or female. If you have any questions about this product by Fantasy Forge Jewelry, contact us by completing and submitting the form below. If you are looking for a specif part number, please include it with your message.